Leisure Activities is a creative hospitality studio, specializing in concept creation, beverage development, project management & bar design. Wade grew up in Phoenix and attended the Arizona State University. Leaving the desert for NYC, Wade honed his craft behind the bar and became enomored with all of the creative elements that make up a hospitable environment and it’s cultural identity. Wade moved to Chicago with hopes of opening bars where people felt truly at home. An avid traveler, photographer and constant student of all things design, Wade oversees creative projects for LA. After graduating from Northern Illinois University, Jeff found his calling in hospitality through eating, drinking and working his way through the myriad layers of Chicago’s bar and restaurant scene. That passion for singular and genuine hospitality has driven his pursuit of inspiration through travel and exploration locally and abroad. When not behind the bar, Jeff enjoys jumping rope, model ship building, hot cocoa and creating fake hobbies. Through strategic partnerships in design, real estate, law, marketing/PR and finance, Leisure Activities offers full service hospitality and beverage consulting, providing long-term creative solutions and operational stability to clients. Leisure Activities has had the privilege to develop bar concepts and beverage programs, execute pop-up events, train and hire staffs, manage social media and most importantly, tend bar. With over 25 years of combined experience, LA consults in all aspects of creative hospitality while remaining deeply rooted in stable operations, continuing to evolve and stay informed of cultural trends. 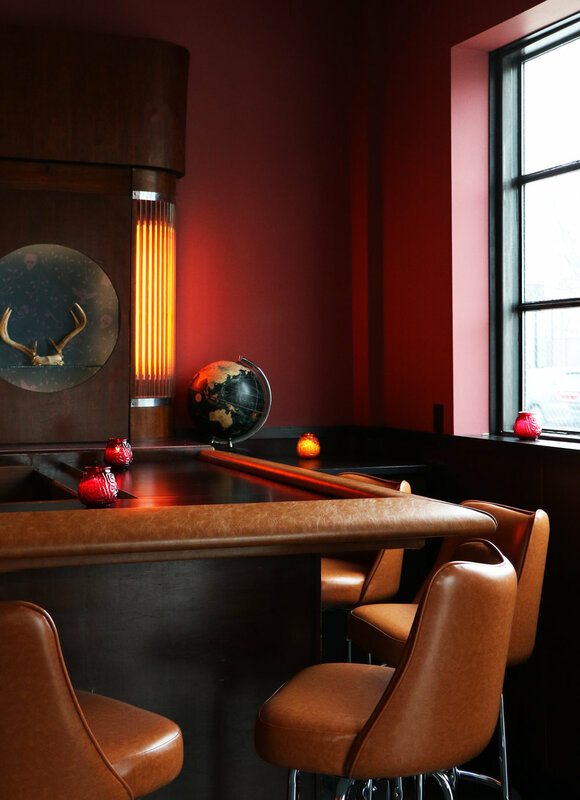 Young American is a progressive bar and kitchen serving punchy snacks, session & spirit-free cocktails, radical wine & collaborative beers in Chicago’s Logan Square neighborhood. Ludlow Liquors is a neighborhood tavern with a focus on stirred cocktails that are available by the ounce. Offering cocktails by the ounce allows guests to taste through the menu in a variety of ways, each with its own unique presentation ranging from simple one ounce undiluted pours to full sized cocktails with specialty ice and garnish. The bar also features killer whiskey sours, draft punches, cheap beers, lively DJs and a cozy backyard garden. Leisure Activities partnered with mentors Matt Eisler and Kevin Heisner of Heisler Hospitality to breathe new life into a run-down, 60-year-old, Ukrainian Village tavern called Sportsman’s Club. The focus would be on daily creativity, great music, top notch hospitality, and an undeniable neighborhood vibe. Sportsman’s would become the new industry darling and destination for not just Chicagoans, but bar professionals from around the world. in 2016 LA partnered again with Heisler Hospitality to open Logan Square’s love letter to the Caribbean and Latin America, the acclaimed coffee and cocktail focused Estereo. Looking for a group that "gets it"? Drop us a line and let's see how we can work together.